Well it is! Your site will be up an running in just 5 minutes. Adding text to your site is as easy as typing a letter with our MS Word style editor. Adding images is as easy as clicking the mouse. You can customize your site to almost any look and feel you want, using one of the 1,600+ templates or have one custom made to fit your company. Click here to seehow easy it is. There is No Risk - And No credit card asked for. You will be up and running within 5 minutes! GUARANTEED! Help's you make money - Guaranteed! Getting a website online is fast, easy and free! That's right free. When you sign up today, you get a free 10 day trial of a fully functional website that you can try out. With your free site, you will get everything you need to have and manage a successful site. Thousands of dollars worth in features are automatically included with your site, and you never have to upgrade or download new features. These features include; shopping cart, newsletter, catalog, photo album, maps, customer feedback forms, links, order tracking, coupons, and much more! Click here to start your FREE 10 Day Trial! Perfect! You don't need to. Our builder is so easy to use, you don't need any programming or design experience to use it. Our features are pre-built ready for you to use, right now! If you can type a letter and click on a mouse, you will be able to build a great website. 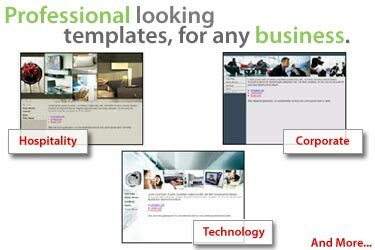 As for the design of your site, we have over 1,600 templates to choose from. Don't see something that you like? We can customize your look of your website. Sounds to good to be true? Click here to see just how easy it is. Choose one of the following price plans to get started today. You can choose to pay for your site per month, per 6 months, or our best deal, per 12 months.